Dental implants have been introduced since 50 years ago by doctors, however, probably not many people know what it really is and whether the way dental implants are safe or not. The use of implants to replace missing teeth is safe, can provide a natural appearance and is already very popular in the world of dentistry. Dental implants are made of a biocompatible material, which is implanted into the gums or jaw bone to replace missing teeth. 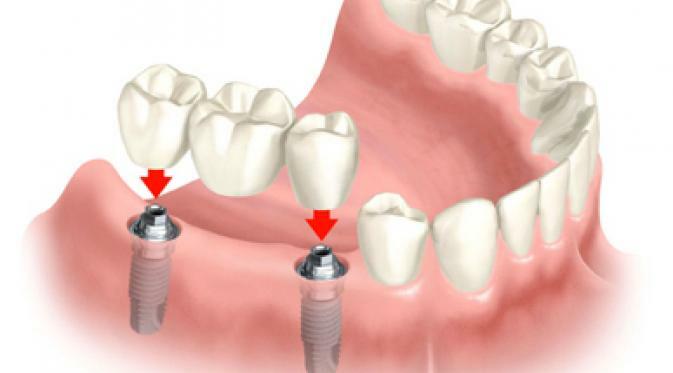 The function of this implant is to replace a tooth or teeth as before. If you are still in doubt, the safety of dental implants, then it is better that you consult with a dentist first. Increasingly good appearance and improve self-confidence. Dental implants can replace missing teeth appropriately so that the proportion of mouth is maintained and designed to look and feel like a natural tooth. Comfort is maintained. Someone wearing a dental implant, will feel more comfortable. This is because the implant has been designed so as if a part of yourself. Long durability: Planting false teeth by means of implants, can survive long. In fact, when accompanied with good care, then the durability of dental implants may be able to achieve a lifetime. Easier to use for chewing: Another advantage to be gained from dental implants is much easier when used for chewing food. It is quite possible, given permanent false teeth will act like a natural tooth, thereby minimizing the occurrence of teeth shift. implant does not require a mass reduction in adjacent normal tooth. In addition, the placement does not close access between the teeth. Helps prevent distractions while talking. Dentures are not buried, may be shifted. It is certainly bad, especially if the owner is talking, so the sound will be heard clearly. For this reason, dental implants are planted to make someone not to worry about apart when speaking. Systemic health conditions of the patient. For example, have diabetes mellitus, because the effect on the healing process after the act tissue implant placement. However, if the disease diabetes mellitus controlled her, the success of implant-would be achieved. A history of dental disease before. Patient motivation and the ability to maintain oral health. Patients with poor oral conditions, is not able to maintain the cleanliness of his own mouth, and have the smoking habit will usually fail if done the installation of dental implants. Consideration of the adjacent teeth, jaw bone and surrounding soft tissues as well as dental implants that will be installed. All information relating to the consideration of dental implants to be obtained through anamnesis, clinical examination, and radiographs (usually dental panoramic photo). Perform X-ray. It is important to assess the quality and quantity of your jaw. Only after that the doctor will determine whether the implants can be done at the location you want or not. Consult with your doctor. You need to consult anesthesia what is suitable for your circumstances. Because of this, it will affect the effect arises at the time of surgery. Tell your doctor what medicines during the time you consume on a regular basis. Tell your doctor if you have certain heart conditions and have undergone orthopedic implants. It is necessary to consult in order to avoid the risk of postoperative infection. Proper procedures in general surgery, dental implants are also at risk. Luckily, serious problems are rare due to dental implants. Even so, some risks following possibilities can be experienced by a person who underwent surgery dental implant installation. Infection appears in the implant planted. Injury or damage to the structure around the planting of dental implants. This may have happened to your teeth or blood vessels around the dental implant area. Nerve damage to the natural teeth, gums, lips, or chin that is characterized by pain, numbness, or tingling. Sinus problems. It may happen when the result of the installation of dental implants in the jaw ends protruding on one of the sinus cavity. To further minimize the risk, make sure the installation is done by a professional licensed dentist.